Giulio de’ Medici, the illegitimate son of Giuliano de’Medici, was born in 1479 shortly after the murder of his father in the cathedral of Florence. 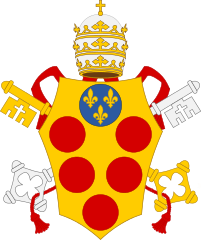 Raised by his uncle, “Lorenzo the Magnificent”, Giulio was made the archbishop of Florence in 1513 by his cousin, Leo X, and a cardinal deacon in 1517, at the age of thirty-eight. Leo chose him as his vice-chancellor, giving him a major role in foreign policy. 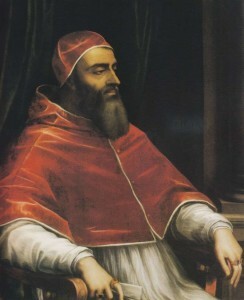 Upon the death of Hadrian VI (1522 – 1523), during a conclave lasting fifty-five days, de’Medici was elected, taking the name of Clement VII. What followed was the papacy of a man who had excelled as second in command but who proved to be lacking in the temperament needed to lead the church at this critical juncture in its history. Chief among his faults was his indecisiveness, which made him vacillate between Charles V, the emperor, and Francis I, king of France. Caught between these ruthless men and their territorial ambitions in Italy, Clement inevitably aligned himself in turn with the wrong one. Eventually Charles defeated King Francis in 1524 at the battle of Pavia. Clement, changing allegiances once too many times gave such an impression of weakness that Charles marched into Rome, sacked the Vatican and desecrated St. Peter’s. A year later, in 1527, an army of mutinous imperial troops made up of Spaniards, Italians and Germans, forced their commander, Charles III, Duke of Bourbon, to lead them to Rome. He died in battle but the army broke through the papal capital’s defenses and sacked Rome. Nothing like this had been seen since the sacking of Constantinople 300 years earlier. Clement surrendered to Charles and was held prisoner for six months before escaping dressed as a gardener. He went first to Orvieto and eventually to Viterbo. Later, concessions were made to Charles but they left Clement virtually a hostage to the emperor. He created thirty-three cardinals chosen by Charles, none of whom were actually worthy from any religious standpoint. More alliances followed, this time with the king of France, and all of these maneuverings coincided with the religious upheavals simultaneously taking place in Germany and in England that would change the face of Christianity forever. Henry VIII’s request for a dispensation from his marriage to Catherine of Aragon went largely unheeded by Clement since Catherine’s nephew happened to be Emperor Charles V. His refusal to grant the dispensation resulted in the great schism in England in 1534, shortly before Clement’s death. Henry had his marriage to Catherine declared void and married Anne Boleyn in January of 1533 which resulted in his excommunication by Clement on July 11 of the same year. Meanwhile, with all the turmoil over the loss of England, Martin Luther’s attack on the primacy of the Popes and clerical corruption could not but succeed. Charles V actually aided the Reformation by allowing Luther to extend his influence throughout Germany. What might have affected the outcome was a general council, which Clement did not call, thereby hastening the effects and increasing the popularity of the Protestant reform. Reform was obviously needed within the Catholic Church itself. Even as early as 1517, attempts had been made to reform notoriously corrupt religious orders. Several confraternities made up of both lay people and clergy were uniting to provide devout priests to administer sacraments and lead morally exemplary lives. These newly formed orders were joined by reformed orders and they not only practiced penance, something sorely missing from the secularized practices they were engaged in, but also they served the needs of the poor. By 1534, Ignatius of Loyola organized a spiritual army to fight heresy and to be at the service of the pope. They called themselves The Society of Jesus, the Jesuits and they became the chief means of bringing about constructive change within a morally compromised church. Their establishment of Catholic universities and their missionary work made them the papacy’s chief defenders and they are still influential to the present day. Clement’s abilities and strengths were that of a scholar and of a patron of the arts, not those of a pope. His lack of political success that resulted in the sacking of Rome, the spread of the Protestant faith beyond Germany to much of northern Europe, and the schism with England, however, did not lessen the good he tried to do by opposing the excesses of the Spanish Inquisition and his compassion for the Jews forced to be baptized at that time. Much to his credit were the works of art produced at that time. Works by Cellini, a jeweler and sculptor, and Michaelangelo whom he commissioned to paint The Last Judgement in the Sistine chapel were just two. He was friends with some of the most renowned Renaissance thinkers, like Erasmus. He was a patron of the historian Machiavelli. 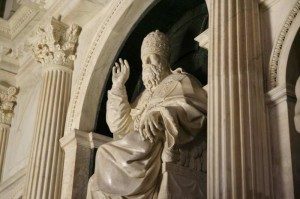 He expanded the Vatican library, restored and beautified churches and buildings within Rome, and he completed work on fortifications within the city. Clement VII died in 1534 and was buried in Santa Maria Sopra Minerva across from his cousin, Pope Leo X.